If your phone can be connected to your computer with an USB cable you can do a lot more through this connection than just recharging it or transferring files to and from your phone’s storage. For example, you can make phone calls, read and send text messages, and see a bunch of other information from your phone, right on your PC. There is a number of Free Open Source software applications that allow you to do this, and you don’t even need to have a smartphone for this to work, just a phone that can connect to USB. Simple and straightforward, GNOME Phone Manager lets you send SMS messages from your computer. Once started it will automatically detect and connect to your phone and sit in your tray with only four menu items available; “send message”, “preferences”, “about” and “quit”. If it doesn’t detect your phone automatically the preferences dialog will allow you to specify a different port that it can try. Aside from that you can also set it up to pop up a window along with a notification sound when you receive a new message on your phone. Sending message is as straightforward as opening a “send message” dialog from the menu, typing the number of a recipient and the text of your message, and clicking send. The down side here is that you would probably still have to look up the number of the recipient in your mobile phone, unless you have it memorized. Wammu is much more powerful. It allows you to manage text messages, contacts, calendar, and other data on your mobile phone. When started for the first time it will launch a “phone wizard” capable of auto-detecting your phone, at least if it is supported. Then the “phone” menu allows you to connect to it and synchronize time. The fun part is the “retrieve” menu which allows you to, one by one, retrieve contacts from both your SIM card and phone memory, your calls log (including outgoing, missed and received calls), all messages and even todos and calendar. It will put all of this content into the right places of your phone tree displayed in the program so you can easily browse and manage it. Some messages may appear jumbled and many phone numbers might not contain the name of the person whose number it is. Your mileage may vary, and this might depend on which phone you have. If your phone supports the function, you’ll be able to delete your calls, messages and everything else. Everything you delete or add using wammu will get deleted in your phone as well, in real time, without need for re-synchronization. This really helps with doing clean ups of your phone messages, calls etc. Once you’ve cleaned stuff up you can go and send some messages, perhaps add some new contacts to your phone’s address book or new events to your calendar. All of this from the “create” menu. You can also create a backup of all your phone content, in case you accidentally lose something, from the backup menu. So long as your phone is easily detected it can be a great tool, even if a bit complex in a few places. Worth trying out. Offering similar functionality as Wammu, but limited to CDMA phones, BitPim can manage contacts, messages, call history, calendar as well as media like MMS messages, photos and camera videos, ringtones and playlists. It also offers a T9 editor. 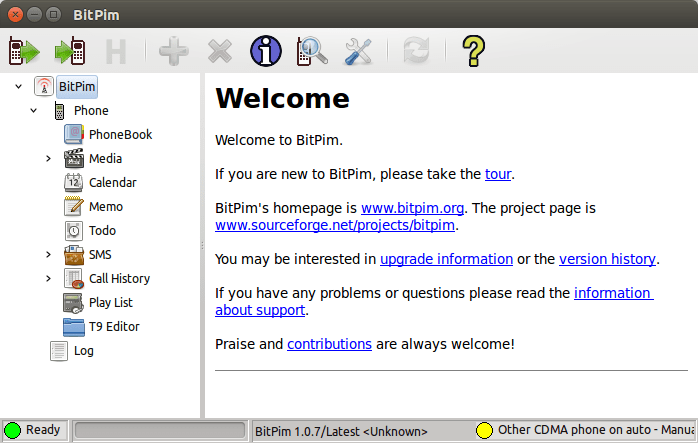 BitPim also has a Phone Wizard that can help you detect and connect your phone, if supported. Helpful pages are available explaining in detail all of the functionality along with usage guides. 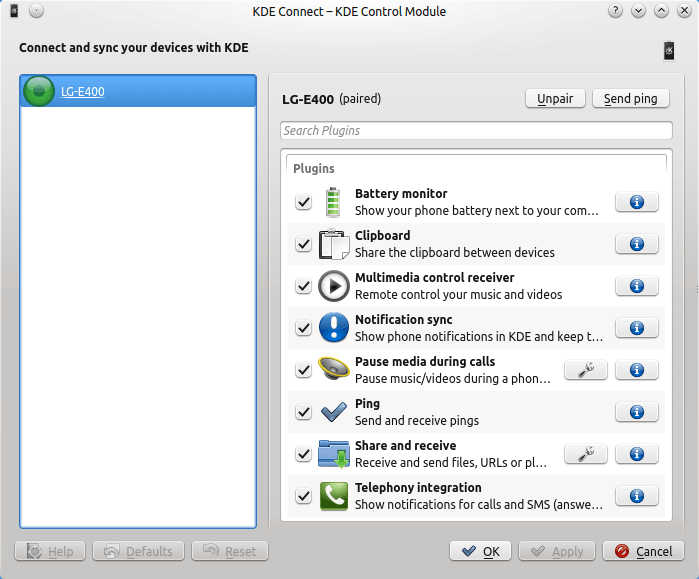 This one is a bit different from the others in that you need to have an Android smartphone to install a KDE Connect app on in addition to installing KDE Connect on your Linux desktop. After you sync them you can receive notifications from your Android phone on your KDE desktop (including app and alert notifications on Android 4.3 or higher), easily transfer files (as shown in this video) to it, sync clipboards, and even control your PC’s media playback from your phone. Once the apps are installed on both devices your Linux PC will be visible in the Android app allowing you to request pairing. Upon clicking “accept” in Linux the device is recognized and allows you to select which plugins to use, each representing a given functionality. Works beautifully.